Fans of Pulse Ultra and P.O.D. will like Souls Harbor. The music produced here is top quality, and the sound is full and rich. Started as a side project to pass the time by three Marine grunts and a Navy man, Souls Harbor eventually grew into so much more. This is melodic rock with hooks. Some of the tracks start with aggression and just keep busting your lip all the way to the end -- no let up, no getting up. They have that rock/alternative sound and have a good front man belting out the tunes. Sometimes the vocals get a bit much but a guitar always comes in to soothe the pain. 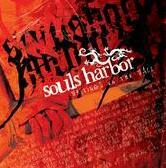 Souls Harbor have a confrontational style of music. They are in your face and at your throat at times. The music is well done and since they fall into the alternative metal and hard rock categories they can switch with ease on each song. It never gets boring. Souls Harbor: John Fenin – guitar; Rob Cadiz – drums; Tony Bigley – rhythm guitar; Doug Marshal – vocals; Ryland Milonakis – bass. For more information, check out www.myspace.com/soulsharbor. Souls Harbor's "Writings on the Wall" is a hard and heavy CD by a hard and heavy outfit that rocks from the first chord until the last note fades away. The CD sounds great. The music is top notch and the vocals are strong for the most part. However, sometimes the vocals tend to drag and it brings the entire project down just a bit. "Writings on the Wall" ranges from very effective hard rock to strong heavy metal and when the two combine, it is hard to beat. This is one of the best things about reviewing music for Rough Edge. Every once in a while a band comes out of the blue and kicks you right in the teeth and Souls Harbor, with their CD "Writings on the Wall," are just that kind of band. For more information, check out www.myspace.com/soulsharbor to get a taste of this CD. Once you do, you will be a convert just like I was.